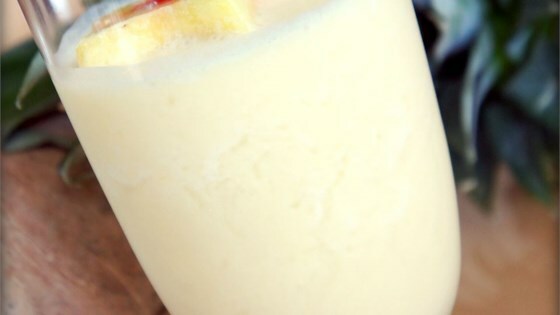 "This delicious pina colada can be a tasty breakfast treat, after-school smoothie, or a light dessert! Plus, kids love it! And, it's way lighter than it looks! Garnish with a cherry or soy whipped cream." Combine pineapple, yogurt, soy milk, cream of coconut, and ice in a blender. Blend on high for about 2 minutes. Pour mixture into a cup. You can substitute coconut milk for the soy milk if desired.